We have a woodpecker that pecks on our metal chimney caps.. The sound is horrible and happens not only very early in the morning but randomly throughout the day. Can they damage the chimney metal cap or is my only worry…the sound? As our article explains, woodpeckers will peck on anything that can create a loud sound and no doubt chimney caps are one of their favorite such locations. Over time this can lead to damage. At first it will be just a few small holes but as rain filters into these holes, rot and insect problems fill follow. It’s best to chase them off and keep them away to avoid this problem. And the best way to keep them away is to install an ATTACK SPIDER up on the edge of the cap. Once in place, it will keep them away for sure and help prevent any damage. They are pecking at our shingles and making holes in them and we are feeding them. HELP! The fastest way to stop them right away is to install some ATTACK SPIDERS where they are pecking. These will guard your house and chase them off until you solve the real problem which is no doubt “food” related. And to get long term control, you’ll no doubt have to take away their food. My guess is you have some kind of insect in the shingles, like CARPENTER BEES, and until this problem is addressed, the woodpeckers will just keep coming around because they can hear the insect activity on the home. For more information on what might be happening, read our WOODPECKER CONTROL ARTICLE. I recently hung a big bird feeder in my yard in front of my kitchen window. 2 weeks later I have 2-3 woodpeckers pecking on the metal gutters everyday. How can I stop this? Do you think it’s the bird food? If you review our WOODPECKER CONTROL article, you’ll learn that woodpeckers will commonly use anything metal to “sound”. The types of metal they love to use will include chimney caps, metal siding and rain gutters. The sound the woodpeckers are creating is used to mark territory and communicate with other birds of their species. This behavior tends to be most prevalent during the spring but it can continue year round. So to answer your question; no, the bird food is not causing them to sound. And if you’d like them to stop, the simplest thing to do would be to install some IRRITAPE or ATTACK SPIDERS where they’re active. If you find them pecking at one location, the Attack Spider would be the best way to proceed since it’s very effective and when used alone, will cover the largest area. But if they are pecking at any part of your entire gutter system, installing some Irritape every 10 feet around the home will prove more cost effective overall. Hi, I have a woodpecker which has been pecking the heck out of the wood siding of my home. I don’t see any type of insects, but was told there are probably beetles in the wood. What product(s) do you recommend that would either kill any type of insect and/or the Beetles? Thanks so much! If you review our WOODPECKER CONTROL article, you’ll learn in fact there are many types of insects these birds might targeting. This time of year the most common include CARPENTER BEES and POWDERPOST BEETLES. Now if you have cedar or some other wood covering on the home, you’ll need to do a thorough inspection of the wood siding and attempt to figure out just which insect (or insects) it specifically might be. This is important because the treatments can vary depending on each and really there is no simple “one spray kills all” method that can be employed. So what can you do now to stop the birds from damaging your home? For now, I recommend you get some ATTACK SPIDERS and install them where the wood peckers are most active. This will stop them from pecking and doing further damage. During this interim, I also suggest you spend some time trying to figure out what insect might be nesting on the siding. Again, it’s paramount that the woodpeckers food source is identified if you are to get any kind of long term control established. Now if you can’t figure this out yourself, give any pest control company a call. Most all will come out and do an initial inspection free of charge. And once you get the home inspected and secure a reasonable explanation on just what is nesting in the wood, you’ll be able to decide if you want to hire the service company to do the work or get the products they’d be using from us and do the work yourself. I’m looking for a repellent spray I can apply to my house to stop woodpeckers from pecking on it. They seem to like my house. Maybe it’s the siding or paint I don’t know. But every spring they start pecking and chipping away at certain areas and the damage is significant. What can I spray to stop them and keep them away? Woodpeckers pecking are almost always targeting something in the wood. My guess is you have some kind of insect that must be living in the siding if the woodpeckers are working large areas and not creating nests. You can read up on why taking away the woodpecker food will really help in our WOODPECKER article. 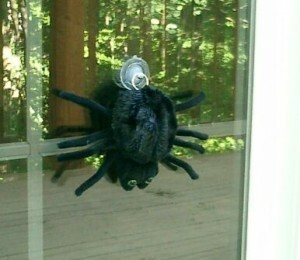 But since their season is about to start, I suggest you get some ATTACK SPIDERS installed around the home. These work really well and will stop any bird from actively landing where these spiders are deployed. I also suggest setting out some BIRD TAPE to cover the peripheral areas where you don’t necessarily need a spider. So if you set these two deterrents out now and followup by trying to figure out what it is the woodpeckers are seeking, you should be able to make the home woodpecker proof and keep them away for good. the back and has many very large picture windows that have a sun screen film on the inside. This is slightly reflective on the out side. One of these woodpeckers is very persistent at pecking at these windows .He also is stripping a lot of bark from a large oak tree just behind our house. What can be done out side of shooting these birds? Install some JUMPING SPIDERS onto the windows where they’ve been seen. As you can see in the video embedded on our product page, this motion is scary to birds. Any bird attempting to peck the window will activate the spider which will cause it to leave immediately. Install 1-2 on any tree you want to save and within a short period of time (1-2 weeks), they will move off your land to forage for food. those @#$%^&* pileateds have returned after a year’s hiatus. they strip wood from our all cedar house. we have the exterior sprayed once a month & they specifically look for carpenter bee holes. we have had to replace an entire, lg. Pella window, lots of siding etc. it’s run us into $1,000s of $$. we also live next to a woods. i am very angry. they are brazen and when you run them off they come right back. my neighbor is having the same trouble. we are away mos. of the yr. so monitoring is difficult. HELP!! Two things you need to do. First, treat the nests as explained in our CARPENTER BEE CONTROL article. Second, install some JUMPING SPIDERS above any sections where they’re active. As long as the Spiders are there, the birds will stay away! We have big Bradford Pear Trees and we never see or hear the Woodpecker’s. But our trees have thousands of holes where they have been pcking. What can we do about it? You have a couple of options. First and foremost, it’s important to understand the woodpeckers are feeding on insects that no doubt are nesting on or in the bradford pear trees. It just so happens bradords are subject to many types of insects moving “in” on them. What I mean is that there are many types of boring insects as well as bark seeking pests which will take advantage of vulnerable pear trees. Some of these insects will be targeting your trees for food. Others will be using the tree to nest or hide during adverse weather or even for an entire season. So to decrease the amount of interest woodpeckers will have for your trees, it would be wise to spray them 2-3 times a year. Simply treating the trunk and limbs with CYPERMETHRIN can not only kill anything living on them but also repel most any pest. In the end, reducing the amount of food on the tree will go a long way at reducing the amount of woodpecker interest which in turn will cut out the damage. To deal more directly with the woodpeckers, you can install some IRRITAPE to the trunk sections where they seem most focused. Cut 1-4 foot pieces as needed and tack them on anywhere you see pecking and damage. Spread out the tape by 3-6 feet and you should be able to get good enough coverage to keep them away for good. Another visual repellent is our ATTACK SPIDER which can be mounted pretty much anywhere. Both these products serve as a visual repellent and are designed to keep them off and away from trees you want to protect but they won’t reduce insect activity or infestation which is most likely why the woodpeckers are coming around. Reduce this population and in the end you’ll find the trees will both last longer and not draw so much attention that usually leads to damage. Woodpeckers are pecking holes all the way around my satsuma trees. How can I keep them away? I thought about wrapping some of the branches & parts of the trunk in foil. Will that work or hurt the tree?? I’m not sure on using “foil” but I do know two things that will. If you only have 1-2 trees where they’re active, hanging a JUMPING SPIDER close to where they land will assuredly keep them away. IN most cases they’ll start foraging elsewhere and within a week you can take down the spiders using them as needed throughout the year. Another option is to lightly wipe down the trunk and tree limbs they’re using with some 4-T-B REPELLENT. It’s a non drying glue like product that lasts a few months. They won’t like landing on it and will avoid any place it’s applied.